The Samsung Gear S4 has arrived. 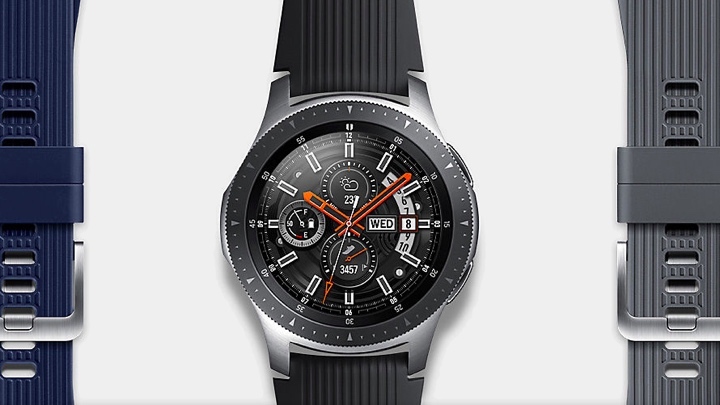 Except it's not called the Gear S4. The number and the word Gear have been ditched and replaced by the new Samsung Galaxy Watch. Going toe-to-toe with the Apple Watch Series 4, we've already run the rule over the smartwatch in our Samsung Galaxy Watch review. And we really liked it in both 46mm and 42mm forms, putting it up with the very best smartwatches to buy right now. If you just want a run down of the key features and what to expect from the new Samsung smartwatch, we pick out the key specs, features and all-important pricing details that you need to know. As we've already mentioned, the Galaxy Watch is available in two different sizes for the first time: a silver 46mm version and either black or rose gold in the 42mm option. 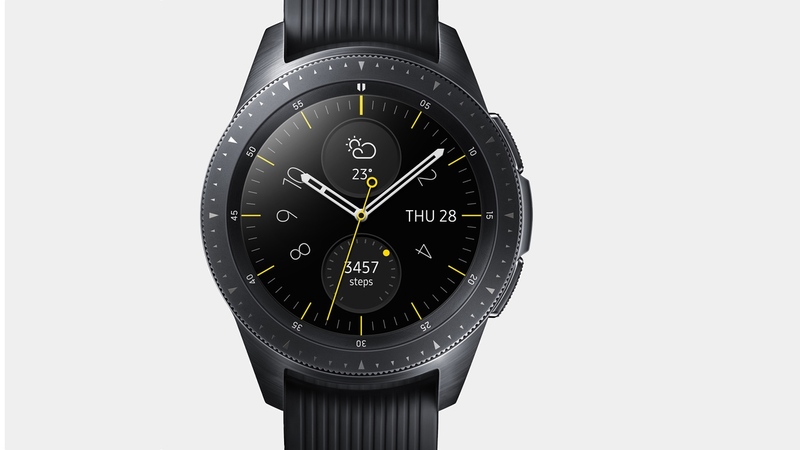 A Samsung Galaxy Watch LTE model will also be up for grabs in the coming months. 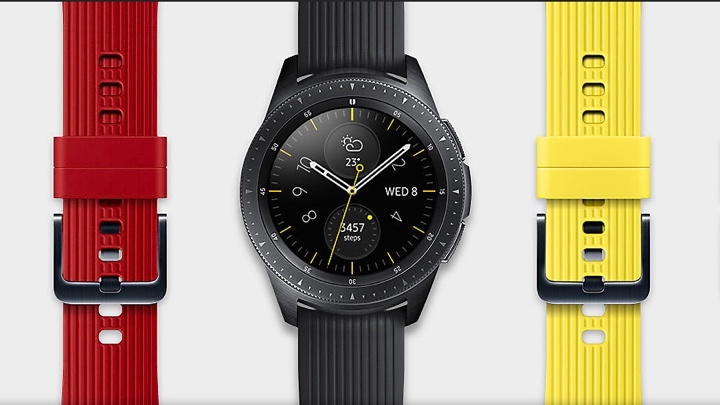 There's also the Samsung Galaxy Watch Golf Edition, which is essentially the same watch with added some added software to make it more useful for your next round of golf. Unfortunately this one will only be available to buy in Samsung's native Korea. When it comes to straps, the 46mm option supports 22mm interchangeable straps with the 42mm compatible with 20mm bands. Speaking of compatibility, all of the Galaxy Watches are compatible with iPhones and Android phones if you're looking for an Apple Watch alternative. In terms of the physical specs, the 42mm option features a 1.2-inch, 360 x 360 Super AMOLED always-on display, weighing 49g and officially clocks in at 41.9 x 45.7 x 12.7mm. And that's slightly different to the 46mm Galaxy Watch, which comes in at 46 x 49 x 13mm, weighs 63g and packs a 1.3-inch always-on screen with the same 360 x 360 resolution. Both Galaxy Watches are waterproof with a 5ATM certification, letting you take them for a swim at up to 50 metres deep. 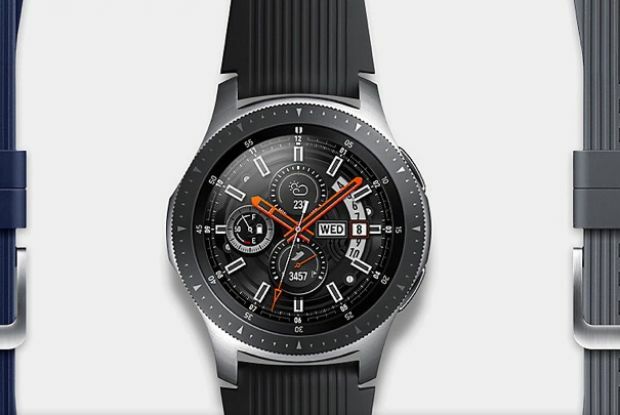 Both Galaxy Watches come running Tizen OS 4.0 - not Wear OS, as was rumoured pre-announcement. That gives you staple features like full notification support for WhatsApp, Facebook, Twitter and more. 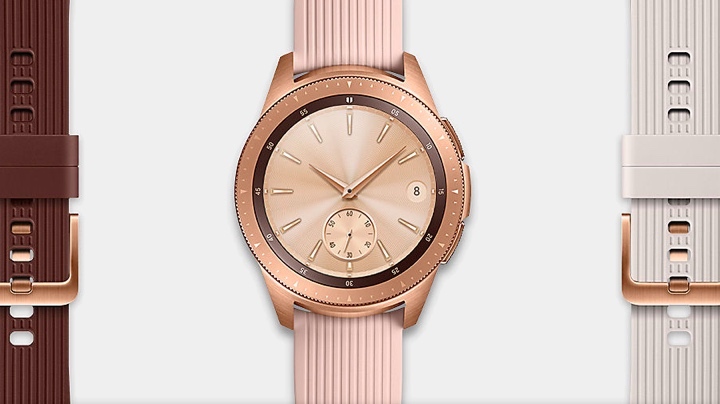 There's plenty of Galaxy Watch faces to choose from too, and downloadable apps including the only dedicated Spotify app on any wearable, while you'll be able to store health and fitness data in Samsung Health. You still get that now-signature rotating bezel, NFC for payments, 4GB of internal memory, Bluetooth, Wi-Fi and a speaker/mic setup for making and taking phone calls. That also unlocks the ability to access Bixby, Samsung's assistant answer to Siri, Google Assistant and of course Amazon Alexa. On the sensor front, there's plenty here to track movement and more. There's a heart rate monitor, although no support for third-party heart rate monitors. There's also an accelerometer, gyro, barometer and an ambient light sensor. 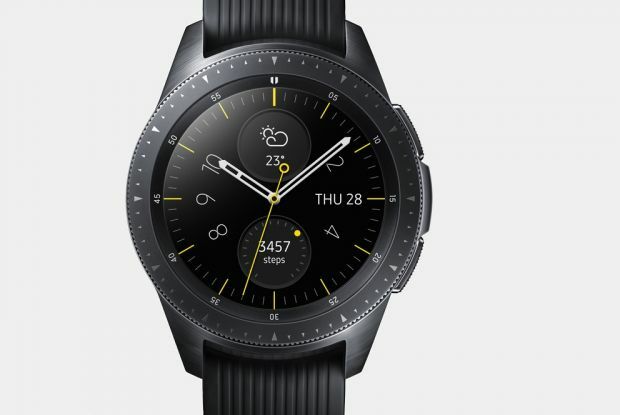 Letting users cut away from their smartphones and go standalone is clearly a much more real experience with the Galaxy Watch, thanks to its improved battery life and 4G capabilities, but the device also debuts new wellness and exercise features from Samsung. The Watch is able to automatically detect high levels of stress and offer users breathing exercises to help keep them relaxed and focused, while also track sleep cycles during the night. Then, during more active hours, the Galaxy Watch will be able to offer 21 new indoor exercises, tracking a total of 39 workouts, and also let users log details of their nutrition through Bixby Vision on a Galaxy device. This is smartwatch fit for running, swimming and cycling. But wait, there's more. Wearers can control devices on the Watch through the SmartThings app, keep information secure through Samsung Knox and unlock their PC using Samsung Flow. We mentioned the improved battery life, which differs between the two models. 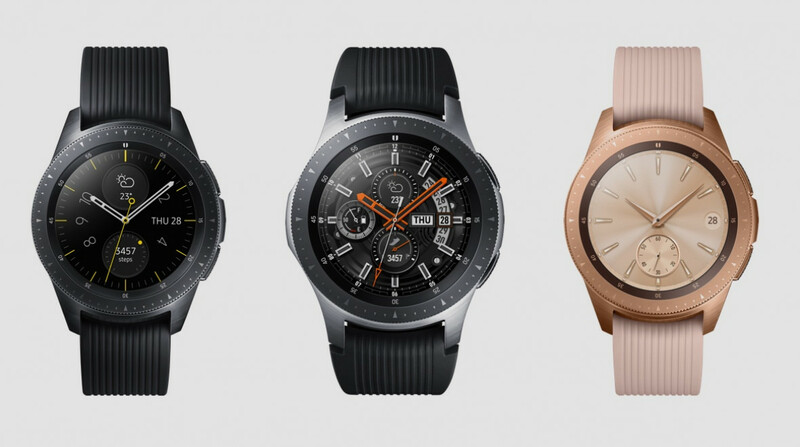 With the 46mm Galaxy Watch, Samsung claims you'll be able to get around seven days in low usage and up to four days with the 42mm version with the same low usage. In terms of the charger, it's a near identical to the one that ships with the Gear S3 and the Gear Sport. So a small, black cradle that you can place the Watch inside of. 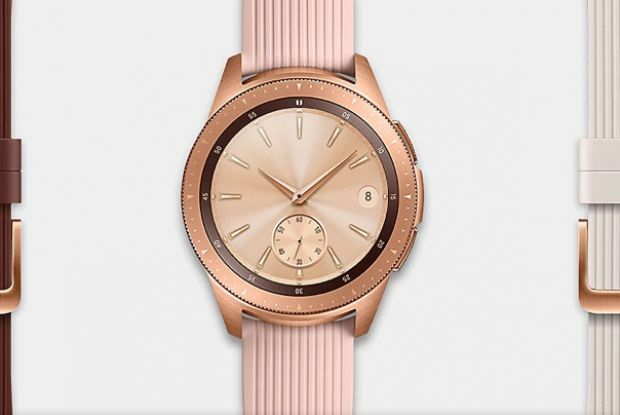 So the Galaxy Watch appears to be packing in a lot for users to play with, but not everything that was rumoured made it to the device. 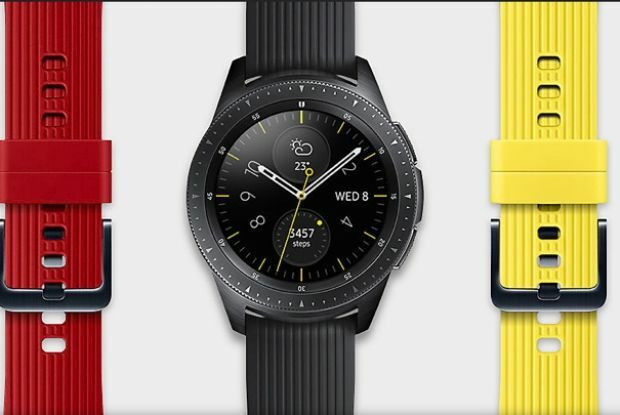 For example, prior to the official announcement, blood pressure monitoring was touted as a potential feature of the Galaxy Watch. However, this did always feel a little unlikely, given that devices require FDA approval in order to include the tracking. Instead, it appears as though the wait will go on until will see this come to a mass-market smartwatch. The 42mm Galaxy Watch is available for $329.99 while the 46mm version costs $349.99. Both are available in the US via Amazon, Best Buy and Samsung.com. In the UK, you can also pick them up from Amazon and retailers like John Lewis and Currys PC World. The LTE version of the watch will arrive on T-Mobile, AT&T, Verizon and Spring later in 2018. We're still awaiting on LTE details in the UK. There's no indication on pricing, but the luxury of an untethered experience is certain to cost you more. - Pre-installed Nike+ App/Make it competible again with Nike+ App. Or make the a Nike+ edition, would be fine. I just want to continue what I started in Nike+. But also, I love Samsung device. Very interested unless they make only one small model. I want a big watch with a big screen. I've been waiting a long time for this and if they don't at least make a bigger model (at least the size of the S3 - not thickness but overall screen size and manliness, I will be very annoyed. I need Google Pay as Samsung Pay is extremely bizarrely not available with my major UK bank. Why samsung can't give us heads up what to expect from Samsung gear S4. I just got gift of S3 and samsung sales rep keep on telling me to wait but how long should i wait and why? they said they are not allowed to tell. why so much secretive from customers. I hate surprises. *Galaxy Watch has ISO 22810:2010 certification for 5ATM rating of 50 meters (165 feet) under specific conditions. This means that both devices are safe to wear while walking in the rain or showering, and may be used for shallow-water activities like swimming in a pool or ocean. However, the Galaxy Watch should not be used for scuba diving, water-skiing, or other activities involving high-velocity water or submersion below shallow depth. 42mm still to thick need to be closer. To 11mm black sporty only no thanks, the inly think I like. Is that sleep tracking is so integrated unlike Google wear OS. i bought a samsung gear s3. Was happy about it until samsung killed the battery with an "update", so when they promise "7 day battery life", i am left with the question "7 days until which update"?